If you take a look at the entire sport utility landscape, most offerings look basically similar—rear- or mid-engine layout with a relatively open cab area. In many cases, you need a pretty savvy expert to differentiate different brands from a distance. That is certainly not true of the new Massimo Warrior 800! As the name telegraphs, Massimo is aware that the Warrior has more than a vague military look to it. Our riding group took to referring to it as the “Indiana Jones car.” First off, the unique all-steel body has exactly zero streamlined and aerodynamic surfaces. That would be odd if the Warrior 800 was an airplane or a sports car, but it is a utility vehicle. Those square corners and flat planes maximize cargo area. In addition to a roomy bed area, the bed has the ability to add stake sides for more capacity, and the hood area isn’t wasted space. Instead of a fancy curvy plastic part, the hood of the Warrior is a flat area bounded by a low rail. 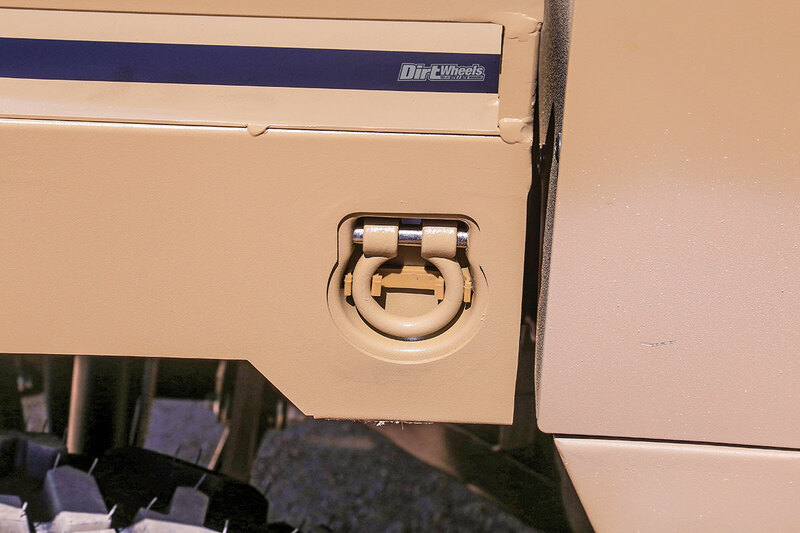 In addition, the front and rear cargo areas are loaded with robust fold-away cargo tie-downs. All three of the seats are adjustable fore and aft. The shape of the seats is nice, the density is good and the cover feels like it is tough enough to last. The center seat has a lap belt, but the outer ones have shoulder belts. Massimo started with a one-piece chassis that is somewhat wider and longer than the norm for a utility model. For example, the new Polaris Ranger is 120 inches long and 62.5 inches wide, which is pretty wide for a utility machine. By comparison, the Warrior 800 is 131.5 inches long and a full 70 inches wide! For many machines, the widest part is the tires, but on the Warrior 800, the body is every bit as wide as the stance. Trails that are plenty wide for a 60-inch car leave the Warrior trimming brush. No doubt that played into the choice of Desert Tan as a color rather than Forest Green. This machine is clearly more at home when there are wider trails. While the body is unique, the double-A-arm front and rear suspension is conventional. All four shocks are beefy in construction but are not adjustable. Suspension travel is a modest 7 inches. It actually has five disc brakes—four hydraulic ones for the four wheels and a fifth cable-operated one on the rear drive shaft as a parking brake. Tires are 27 inches mounted on 14-inch cast-aluminum wheels. Both differentials lock and unlock (for turf). The electric power steering is standard, and it works well. The wheel tilts, but there is plenty of seat adjustment. When the seat is all the way back, we wished the wheel telescoped as well. There is a steering wheel lock as well. The sporty-looking dual-exit exhaust looks a little out of place here, but it works well and sounds good. A-arm guards are standard for the front and rear suspension. The hitch mount is standard as well. We love the sound of a V-twin engine, and the Massimo’s 800cc, 60-horsepower engine is no exception. The surprisingly sporty-looking, dual-outlet exhaust sounds great. Our Warrior arrived brand new. As it broke in, we smelled some coatings on the exhaust system baking on, and we worried that it might be the belt. We haven’t felt or heard much belt slip. That is despite some pretty serious climbing. The engine is based on a single-throw crankshaft that mounts both connecting rods side by side. Conforming to modern standards, the pistons are on the short side. Each cylinder head has a single overhead camshaft and four valves. Naturally, it has EFI. There is park in the transmission, but there is also an emergency/parking brake between the driver’s seat and the middle seat. We found that the CVT reacts very smoothly in forward or reverse. Engine braking drops away with the rpm. It, obviously, happens earlier in high range. The engine braking is more consistent in low range, but it eventually drops out if you coast off-throttle long enough. Electric power actuators raise and lower the steel dump bed. The bed doesn’t raise or lower quickly, but it seems to have plenty of power. Massimo left the Warrior Spartan on the inside. There are a plethora of switches, a roomy locking glove box and a compact instrument display. The cab is very wide, and the three identical, full-size bucket seats are pleasant and supportive. The seats on the sides have retractable three-point belts, but the center seat has a lap belt. There is ample elbow room for all three passengers. There are no cup holders, but there are two rear-view mirrors. 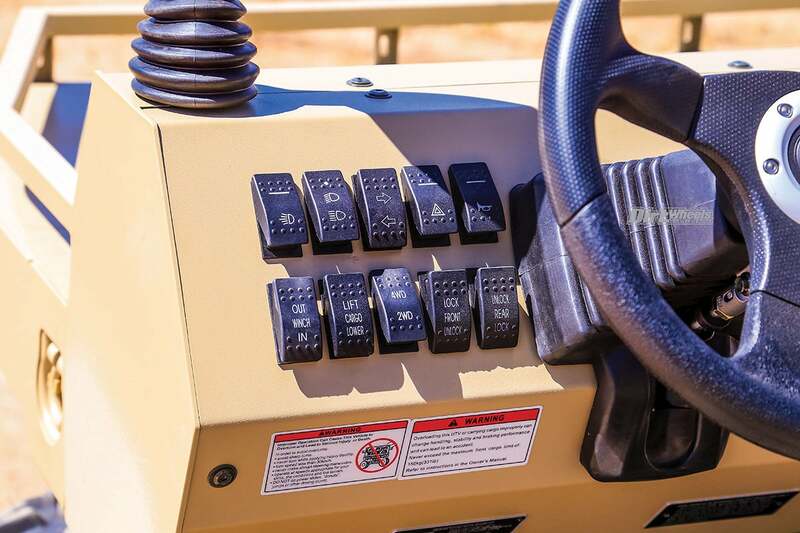 Shifting is accomplished with a long dash-mounted lever. The car shifts easily and smoothly. There are no doors or nets to close in the cab. As you might imagine, entrance and egress are easy. Interestingly, the Warrior has a key switch and a start button. When you switch on the machine, the car runs through a brief reset. Both the tachometer and speedometer gauge needle swing through their full arc. When that is completed, the starter button is live. The odd thing is, you can also turn the key to the final stop and that starts the engine as well. We aren’t sure of the exact reason Massimo chose to go with an all-steel machine of this size. We had no problem trailering it, but it does weigh 1830 pounds. The new Polaris Ranger 1000 is quite a bit lighter at 1565 pounds. 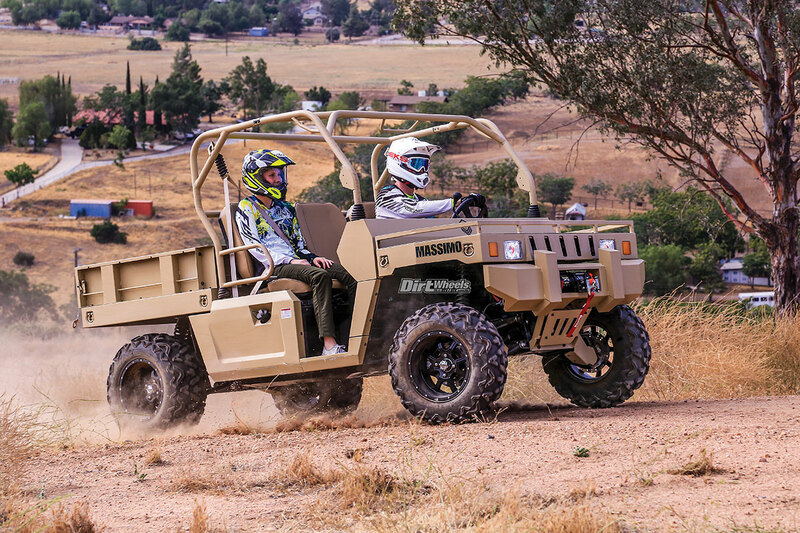 Kawasaki’s Mule Pro-FXR is also smaller than the Warrior, but it weighs 1768 pounds with its steel bed floor. No doubt the amenities push the Warrior’s weight up a bit. 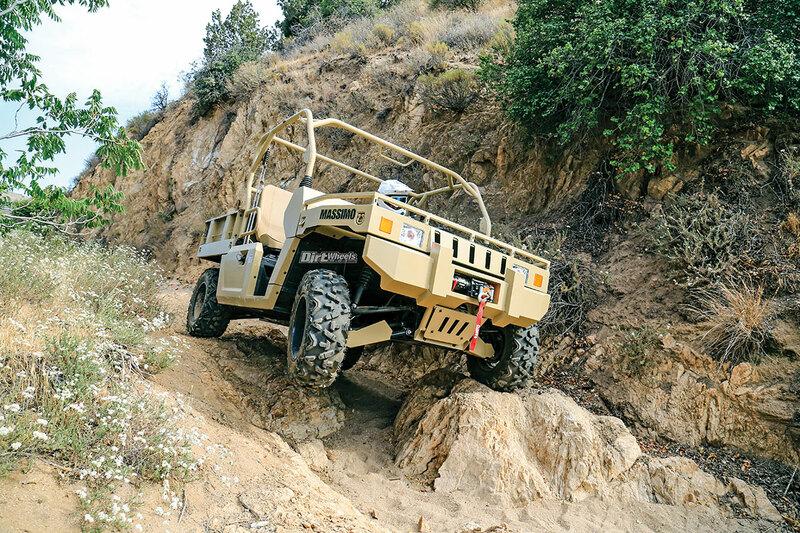 The Warrior comes stock with a good-sized winch and electric actuation for the bed. It also has a massive and protective steel bumper in front. 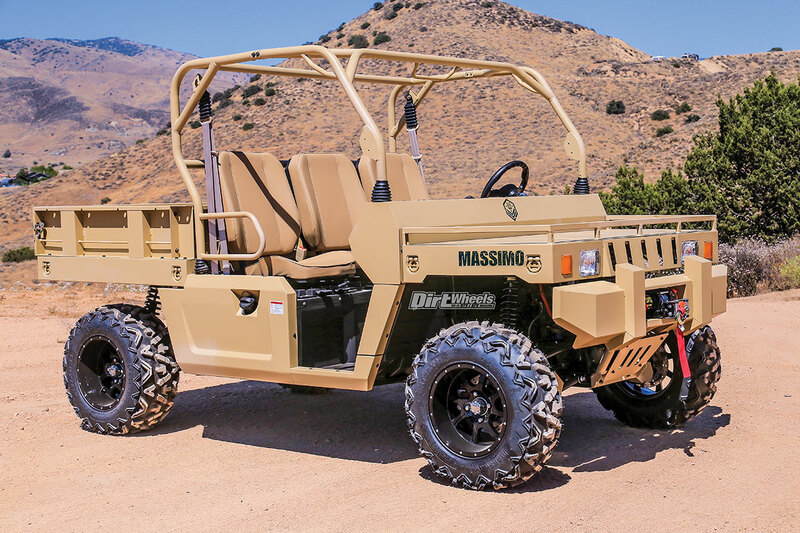 Massimo does have a plastic roof and a tilt-out windshield available, but they are options and are not included in the weight. 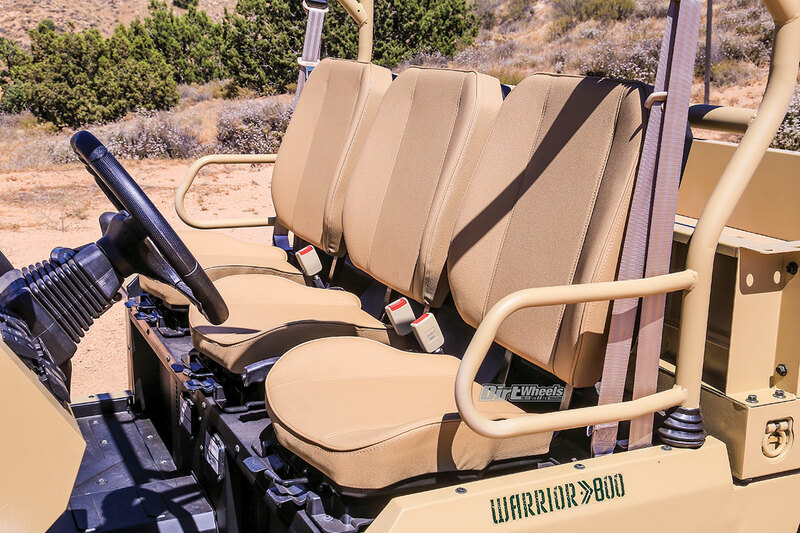 With two passengers in the Warrior, it is easy to see how roomy this machine really is. 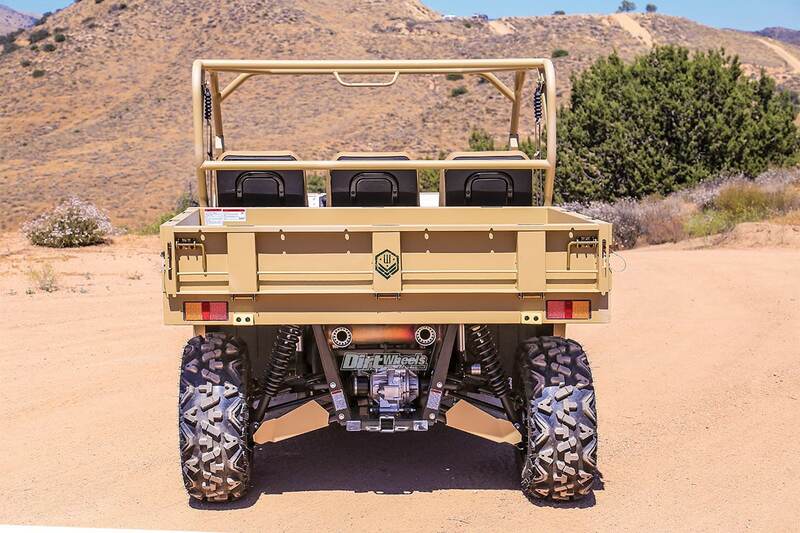 It lays down a large footprint, has plenty of features and doesn’t look like your neighbor’s UTV. The upright seated riding position is comfortable for a rider in excess of 6 feet tall, but suited shorter pilots equally well. We found the seat-foam density to be quite supportive, and, as we mentioned, there is ample elbow room for three adults. 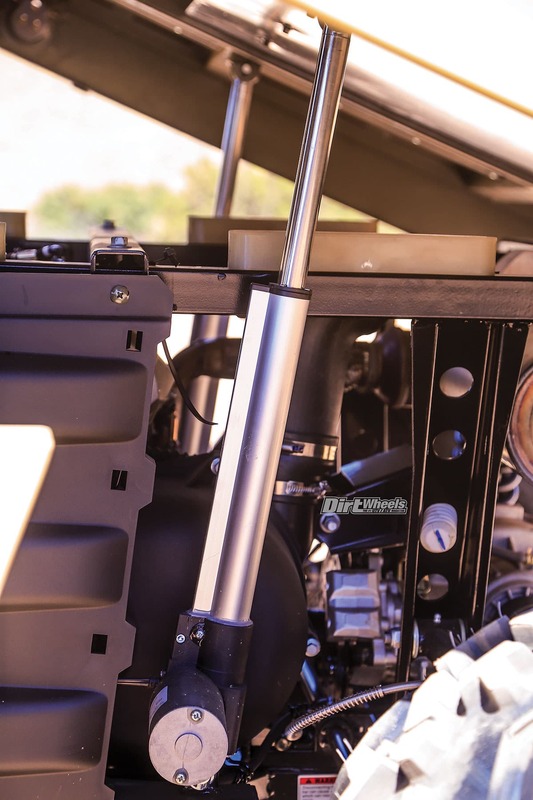 Massimo chose to mount the instruments in the center of the dash, and the gauge faces that would be easy to read right in front of the steering wheel are harder to see when they are a ways away on the dash panel. The seat belts are easy to use. One middle passenger wanted a shoulder belt. For the speeds this machine is expected to see, the lack of doors is understandable, but doors or nets would add a feeling of security. We loved the mirrors. Every UTV should come equipped with them. The switch panel offers plenty of choices. Note that they include the power bed lift, a horn, turn signals and lock/unlock for both the front and rear differentials. The stock winch is controlled here as well. When we hit the trail, the car certainly didn’t feel heavy. Performance is smooth but has plenty of spark for most folks. We would like to see low range be a bit lower, but we didn’t fail any climbs we attempted. The track is so wide that it feels planted and secure on cambers, and the long wheelbase keeps everything calm for climbing and descending. Suspension action is actually amazing for the limited amount of travel it has, so we didn’t miss the adjustment features. These heavy-duty tie-down points are located everywhere on the body, but they are far from the only tie-down points. There are a lot of options for cargo, including the option of making the bed a stake-side. We worried that the squarish profile would signal a clunky drive, but that wasn’t the case. The handling is calm, the suspension soaks up the terrain, the steering requires little effort, and the brakes are strong and engage smoothly. Visibility and comfort are very nice. We will say that this machine is definitely noticed wherever you take it! At a price of $12,999, it is quite capable. There are other machines in the class that tow more than 1500 pounds and that carry more than 500 pounds, but there are no front seats with this much room for three people. We can easily see camping, hunting, working or simply exploring in the Warrior. You know, anything Indiana Jones would do. Massimo’s Warrior 800’s Desert Tan coloring is quite effective camouflage in Southern California. This baby is wide and comfortable for three full-size passengers. 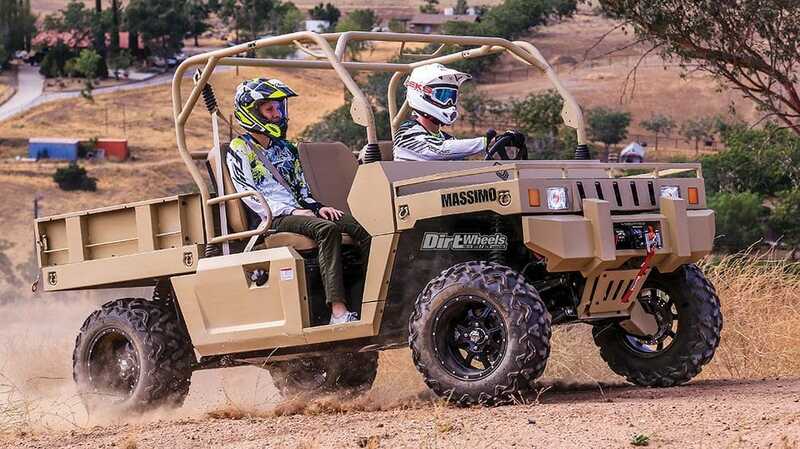 It is an effective hunting, camping or work choice in UTVs.